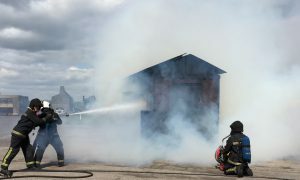 The Angus Fire Emergency Foam Service delivers urgently needed stocks of foam concentrate and firefighting equipment to major incident sites worldwide. A dedicated emergency hotline provides a simple means of communication 24-7. Bulk foam stocks are held in constant readiness at foam production facilities and distribution centres in the UK, France, USA, South Africa, Dubai, Singapore and Australia. When a call for help is received an emergency procedure springs into action. Depending on the scale and location of the incident, delivery by road can often be co-ordinated within an hour and by air freight within a few hours. Foam production staff at all sites are on constant stand-by to produce additional supplies of foam. The company has supplied emergency foam stocks to many major fire incidents. These include the large storage tank fire at Milford Haven in the UK, a multiple storage tank fire at Repsol-TPF in Spain where Angus chartered an Antonov 124, the largest heavy transport aircraft in the world, to air lift foam stocks to the incident. In the same year a Boeing 747 cargo aircraft was used to supply foam to a tank fire at Idemitsu Kosan in Japan. In 2005 the Emergency Service was praised for its speedy response in supplying huge amounts of foam to the multiple tank fire at Buncefield in the UK. More recently Angus supplied emergency foam to Punto Fijo in Venezuela and Zueitina in Libya.